Last week, I came home from work to find a pink slip from the post office in my mailbox. I needed to swing by the main building in downtown Wheaton and pick up something. The sender was listed as "Dreamscape". Um...yes. That's very informative. It took me a couple days to have time to get there. All the while I went through my head trying to remember who "Dreamscape" was and what could they possibly have sent me which would require a signature upon delivery. I needed stamps so picking this up was a good thing. Maybe it was a scam. I can refuse it, right? I was nervous, you need to know, because I simply could not remember anything from a "Dreamscape". The post lady came to the window with a small parcel. Here's the package. I looked it over. It still didn't register as anything I might have ordered. The return address was rather smudged so I couldn't quite tell from where this had come, but I signed for it, thinking it might be something from my friend in Australia. I sat in the car, squinting to read any identifying marks. 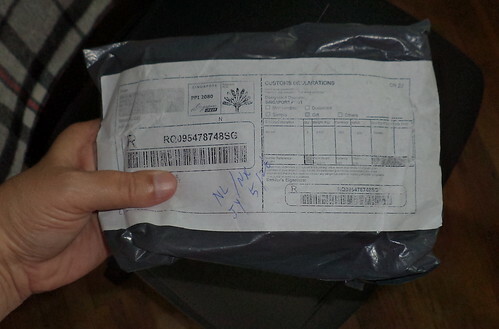 Finally, the words listing the contents of the package became clear. "Dice," it read. DICE! I know what these are! Occasionally, I'll see a Kickstarter listed on some news site I read. For a time, I must have seen a half-dozen Kickstarters for dice. I like dice. As a former weekly Dungeons and Dragons person, dice are cool and a necessary part of gaming. This particular Kickstarter was years ago, I'm thinking at least 2. The designer of the dice has been very diligent about keeping people informed of the process but he vastly underestimated the time it would take to get his idea from concept to finished product. I supported another dice Kickstarter like that and am wondering if I'll ever get my dice although the creator of those dice has become better about answering emails. These dice came from Taiwan. I couldn't get a good photo of the box. 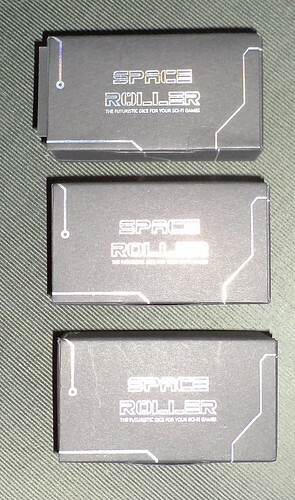 They are called "Space Roller" dice. I liked the simple, other-worldly look of the boxes. Very clean design. The dice? He billed these a "Tron dice", taking their design cue from the Disney movie Tron. I very much enjoyed that movie. It was ahead of its time and wasn't a huge success. Because the Kickstarter was filled beyond what was anticipated, everyone got purple dice. Specific tiers of support, which included me, could pick an extra color. I added the black to the gold and silver. In black light or UV light, the swirls glow, according to the video and photos I saw. I just think they are visually arresting. I liked the little thank you card enclosed with each box. The guy doing this is looking to get into bigger dice production and he thanked us for allowing him to do his first real production. I haven't actually used these to see how true they roll, but no matter. I just think they are cool.